Our Non-Smoking, family, beach home was designed by well-known architect and is directly on a very quiet beach. Fishing is at its best and a boat ramp is located two miles away. Views from the deck at sunset are spectacular. Some of Florida's finest fishing waters are found both in the Gulf and adjacent Lemon Bay. Beautiful white sand beaches are practically uninhabited...A great shelling area, too!! 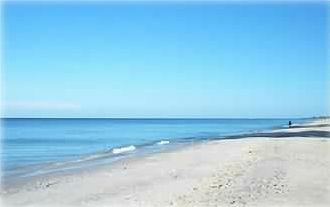 We are also just 45 minutes from Boca Grande, famous for tarpon fishing in late May and June. Guides and day-trips can be arranged. Several beautiful golf courses which are open to the public are just a short drive. Privacy is exceptional as the house cannot be seen from the road and is sheltered by sea oaks and sea grape on the beachside. This long barrier island draws people who want seclusion in a natural setting with abundant wildlife. This is a prime beach location on the West Coast of Florida--no high rises or condos allowed in our area which is a Florida Conservation District. Since we built our home years ago, there are now mansions being built but nothing is like our Florida Beach Cottage. Our family gathers here so that we may enjoy each other and our darling grandchildren. We had our five granddaughters and grandson here on Memorial Day. Very comfortable with TV etc. We spent the week after Thanksgiving here and it was so very quiet and restful...just what we needed. The house was very clean and comfortable, and we even used the fireplace a few chilly evenings. The beach was deserted. Local restaurants were excellent, just a few miles down the road. The owner was available through email almost constantly for questions and answers. We've rented properties several times now and this was the simplest process and most enjoyable vacation yet for us. Thanks Ann! I just returned from a wonderful stay in this home. It has everything you could think of needing from a blender to have a Pina Colada at sunset to beach buckets to hunt for sharks teeth. If you love just walking on the beach, fishing, looking for sharks teeth and being surrounded by nature. This is the perfect house. It was one of the most relaxing vacations. We can't wait to go back. The house was clean, had everything you needed and the photos are very accurate. It is the most private beach I ever had the pleasure of relaxing on. I only saw a few people.